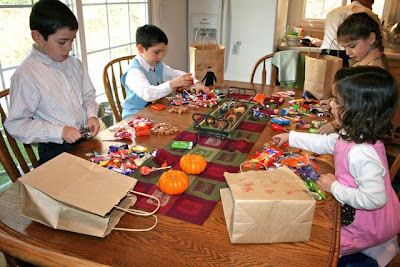 Even though we attend a party on All Hallows' Eve, our children save their candy till after Mass on the actual feast of All Saints. 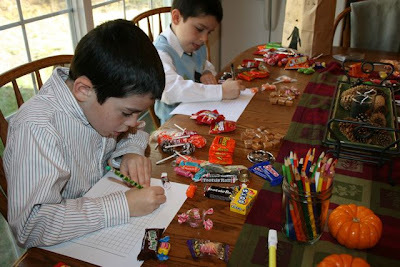 This year I decided to have the boys graph their candy, and they loved the idea! 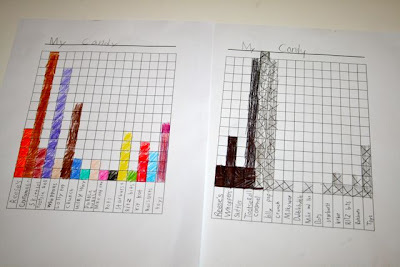 What a great idea to graph the candy! And I love how you saved the candy for the actual feast of All Saints. Thanks for sharing. Thanks Kelly! I saw the idea on another website, when we were looking for pumpkin carving ideas, and thought it would be a fun. What a fantastic idea!!!! I'm going to have the boys do this next year. Okay, so are those religious lollipops I see???? They ARE!! Aren't they great! I am not sure which mom brought them to the party though, or where they were purchased, but Twinkle Toes LOVED them! Beautiful pumpkins, You guys are great at carving!! That All Souls Mass at the cemetary is so beautiful. Mom who brought the lollipops - are you out there???? I asked another mom who was there, and although she wasn't the one that brought them to the party, she also recently purchased some from the Dollar Store. She said they came in a 3 pack. I hope that helps!